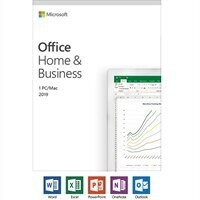 Microsoft Office Home and Business 2019 | 1 device, Windows 10 PC/Mac - BoxFor families and small businesses who want classic Office apps and email installed on one Windows 10 PC or Mac for use at home or work. Classic versions of Office apps including Word, Excel, and PowerPoint. Plus, OneNote for Windows 10. Your activation code will be delivered on a Keycard with detailed instruction for installing the product. The manufacturer does not produce any CD/DVD/Flash drive for this product.